The cardbase is a 5 inch square of SU Rich Razzleberry that’s been embossed with the Couture Creations Satine embossing folder. The next layer is SU Basic Black that’s been embossed with the Couture Creations Diamond Trellis embossing folder. The feature panel is a piece of Xerox Superlustre picture paper that’s been stamped with Versamark Ink. The Mariposa image is from Stamper’s Anonymous. 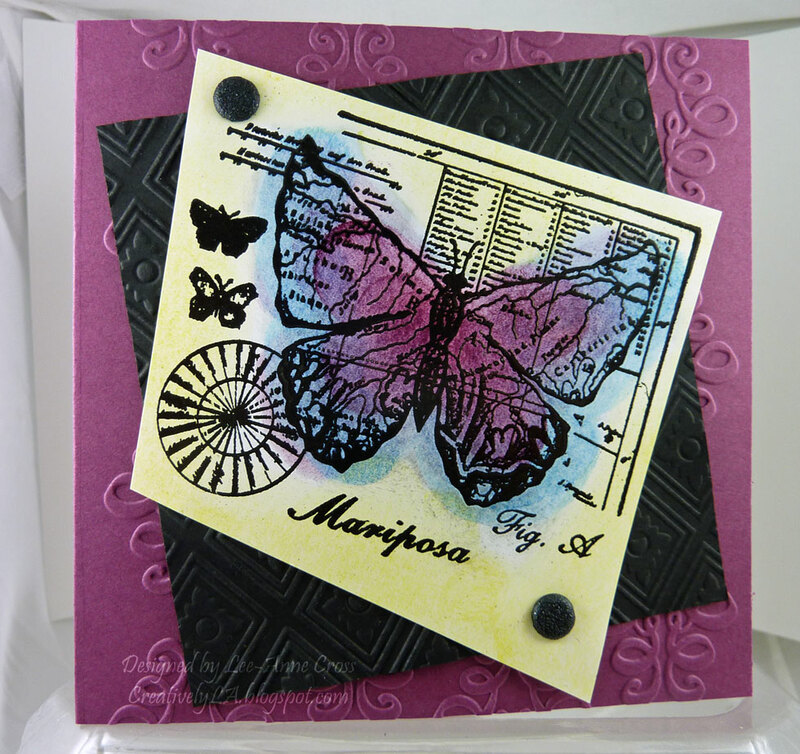 It was then heat embossed with SU Black Stampin’ Emboss Powder. Next, I used my sponge daubers to color the butterfly in Rich Razzleberry and Pacific Point. Then I used another dauber with Daffodil Delight to color the rest of the image panel. I cut it at funky angles for interest and added two black Glimmer Brads for a little bling. Here’s wishing you a wonderful day everyone! Gorgeous! I love the Rich Razzleberry and your great image.